I like birds. God sometimes uses them to slow me down … but that’s a whole other post. I think you’ll love this Guest Post by Brandon Andress which was originally published on September 14, 2016 on his site www.brandonandress.com. Please pay him a visit, he’s rather gifted with the written word. I have begun the process of changing my mind about birds. Sure, you may not find a stranger first sentence than that, but those closest to me know that I have this unreasonable phobia of the feathered friend. It has something to do with a mother bird dive-bombing my head to protect her nest when I was five. And no, to answer your question, I was not bothering her nest. I was simply going next door to a friend’s house. But, there is no reasoning with a mother bird. Anyway, my neurosis aside, I am slowly taking steps to rediscovering the beauty (or some redeeming quality) in birds. An Indiana winter can be brutal and bone-chilling. And it is not made any more bearable by the local meteorologists who giddily, and a bit too affectionately, begin referring to it as a Polar Vortex. The tragedy is they don’t realize that by calling it a “Polar Vortex,” it psychologically becomes twenty degrees colder in our heads. Let’s just be honest here, we do not need “Polar” anything in Indiana, especially when it is already pitch black at 4pm in the middle of December. But there was a moment a few years ago in late winter, when darkness still owned the morning and the cold refused to let go of everything in its grip, that I heard the sweetest song. Through the shroud of night, before the sun’s first rays, amid the polar chill, a melody of hopeful anticipation pierced the dark veil of winter and announced that spring would soon be arriving. It was glorious and profound. The processional of spring, a time of life, new beginnings, and spectacular beauty was coming! And it was being ushered in through song by feathered vocalists announcing its arrival. I, a crusty-eyed morning zombie of multi-layered, nighttime attire (pre-coffee), could not miss this staggering metaphor. When a season of darkness surrounds us and seems as if it will last forever, we may very well begin to believe that this is the way life will always be. But even in the darkness that may surround us, if we are still enough to hear it and patient enough to trust it, there is always the sweet song of the Spirit, leading us in hopeful anticipation, surprising us with beauty in the present, and giving us a glimpse of the life that’s yet to come. I know it is terribly difficult to discuss how we can learn to see beauty amidst the wreckage when we are in the throes of a painful life situation, whether it be temporary or permanent. But, it is in this place where we must always begin- in the place of our pain, in the place of our suffering. For it is in that place where we can, mostly easily, lose heart, feel lost and defeated, grow wildly cynical, and begin to blame God for our condition or circumstance. Even more, our pain can become the place from where we begin to live our lives. The crushing weight of our suffering will always try to convince us that the pain we are experiencing is our only reality and that there is nothing redeemable there, ever. And as a result, the pain we are experiencing can begin to manifest outwardly in our lives into our words and actions, ultimately affecting how we see the world and how we relate to others. That is what suffering can do. It can cause us to reside in our pain, no matter how great or small that pain is, and then become the lens through which we begin to see people, situations, and the world as a whole. And over time, our pain through suffering can very easily spiral downward and lead to questions and then the destruction of our identity, our worth, and our purpose in life. As an end destination, the pain of our suffering can become a place where we stay in bitterness, sadness, anger, hatred, and unforgiveness. As a passageway, our pain through suffering can become the pathway to profound life transformation and new ways of seeing the world. Suffering breaks us down into insufferable little parts where we can either self-destruct or cry out helplessly to God, because we are in a place where we have seemingly lost control. Our pride has been shattered. Our egos have been obliterated. And it is in our place of pain through suffering where we can choose whether we make it our final destination or a transformative passageway. That is the profound mystery of suffering. Suffering strips away any and all control we believed we had over people and situations. And it is in this place, our place of suffering, the place where we have lost all control, where our hearts and minds can either be closed off or open to the healing and transformative love of God. And no matter who you are or what you have been through, or are currently going through, you can choose what you want to do with your pain, and how you receive suffering. You can let it dominate and control how you see the world and relate to others, or you can use it as a means to be taught and guided into a new and more beautiful way of living. About Brandon: Brandon Andress is the author of AND THEN THE END WILL COME! (April 2013) and Unearthed: How Discovering the Kingdom of God Will Transform the Church and Change the World (2010). He lives in Columbus, Indiana and writes for his popular blogs Brandon Andress and A Joyful Procession. Brandon earned his MBA from Indiana Wesleyan University and his BA in Psychology from Hanover College. He loves the outdoors, hiking, camping, and traveling. I know you’re ready for this. Once you heard that my friend Margaret Feinberg had written a new book, you knew I would read it and tell you all about it. Whelp … you were right! 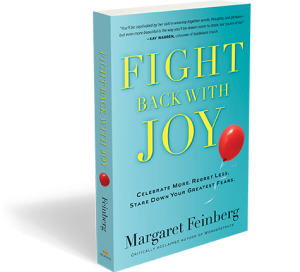 Released this month is FIGHT BACK WITH JOY: Celebrate More. Regret Less. Stare down your Greatest Fears (2015, Worthy Publishing, TN). In FIGHT BACK WITH JOY Margaret chronicles her fight with breast cancer and how her walk with God grew ever deeper in the fight. But, lest you think that this book is only for those suffering a killer disease, let me assure you, it’s not. We all suffer trials and tribulations in our lives. At times we are strong, knowing God is with us, marching along beside us – and sometimes carrying us – through the fire. But there are other times, times we may not like to admit, when our faith may weaken, where we look up into the heavens questioning, struggling to hear His voice. It was by discovering joy that Margaret made it through the fire. It wasn’t easy, by any means. She didn’t just discover joy, she manufactured it. She purposed out actions that would bring joy to others and in turn, received joy herself. Isn’t that the way God always works? We obey and He blesses. We bring aide to another and receive a gift in return. Give joy and get joy. Give praise and thanksgiving to God and get joy and blessings in return. But just how does one find joy in a situation such as this? I don’t think I’m telling too much out of school when I tell you that one of my favorite parts was the chapter entitled Three Simple Words to Set You Free. Margaret tells us, “The journey to joy begins with acceptance.” I nod as I’m reading. Isn’t it true? As I grow older I’m able to consider Paul’s ability to be “content whatever the circumstances” (Philippians 4:11) and not laugh it off like something I’ll never achieve. The deeper my walk with Christ, the more and more content I become. Chalk it up to the Holy Spirit. I could never have developed it on my own. The book has also spawned a companion six-week Bible study which I have purchased but have not yet begun. FIGHT BACK WITH JOY is laced with humor and desperate with pain all the while bringing God’s word to the party in support, guidance, and our prize. As with other studies that Margaret has penned (Wonderstruck, Scouting the Divine, The Sacred Echo) this one has made me think, brought me closer to our Lord, and shifted my walk with Jesus in a delightful, expansive way. Below you’ll find some links (none of which are affiliates so feel free to click away!). Here’s the link to the book on amazon: http://mar.cta.gs/0bi. Here’s the link to the book at Barnes & Noble: http://mar.cta.gs/0bh. To purchase the Bible Study Kit: 6-Session Bible Study Kit: http://mar.cta.gs/0aq. Margaret Feinberg teaches at churches and conferences including Catalyst, Thrive, and Women of Joy. She was recently named one of 50 women most shaping church and culture by Christianity Today. Her books and Bible studies, including The Organic God, The Sacred Echo, Scouting the Divine, and Wonderstruck, have sold nearly a million copies. She lives in Colorado, with her husband, Leif, and their superpup, Hershey. She believes some of the best days are spent in jammies, laughing and being silly.